Snap produce thousands of no No Carbon Required (NCR) books every year and really have it down to a fine art. Common sizes are A5 (148. x 210mm) and A4 (210 x 297mm) but we can print any size up to A3 (297 x 420mm). 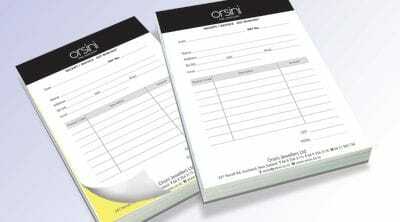 NCR books come in 2 part, 3 part or 4 part in pretty much any colour combination you want. You can have perforated sheets (for tearing out) with bottom sheet fast in book or any combination you like. Numbering is standard. Finishing is generally with a wrap around cover and a writing plate. If you wish you can print on the cover. Most NCR books are 50 leaves. If you are doing a 2 part docket book, this would mean 50 pages of top copy and 50 pages of bottom copy. Need artwork? No problem. We can do that for you too. Call us today for a free quote.